My Xtracycle hooptie rattles around when I go over bumpy roads when I don't have a passenger. Does anyone have a suggestion on how to keep it from rattling? I did move it to the most narrow position which helped but it still rattles around a bit. You have several options, and not one is going to be the correct one, so wiki it is. Use old inner tube inside the mounting clamps. Looks like there is some standard U-shape pipe clamps on the underside? Grease the side rails where they slide into the main body. I would do this anyways because getting those ball bearing latches apart later is a pain. It may reduce the metal to metal contact. Black electrical tape on the side rails. Related to #2, if you stretch the black tape enough, it may get thin enough to wrap around the ends and insert them into the main body. Bar tape. Somebody else suggested this, but wrap the whole top with bar tape. You won't be able to take the sides off after (unless you do something else), but at least your kids won't complain about the cold, wet metal. I'm a bike mechanic who have built many cargo bikes and the rattling is inheritance of tubular cage design. Wrapping electrical tape, gaffer tape won't solve the problem but only makes it harder to assemble (grommet is out of question as the noise comes from the insertion opening and not at the end of the tubing). Since current mounting bolts are a further away from the insertion opening and mounted at 3 o'clock position (front) and 9 o'clock (rear), these 2 bolts only good to prevent horizontal movement therefore we need to add bolts to prevent vertical movement. They have to be at 6 o'clock position and offset from other 2 bolts (closer to insertion opening) ... voila`, no more rattles! Repeat the above modification to other side of the cage :) Caveat : the additional mount holes have to be drilled into the railing insert in order to be tapped for vertical bolts. If there's no insert material at desired locations, bolt thru and lock nut is other option but it may not look as elegant (inconspicuous) as original bolts! Not the answer you're looking for? Browse other questions tagged noise cargo or ask your own question. How to prevent the quick-release pin on the Tektro drop brake lever from rattling? How to keep a huge cargo bike safe in the city? 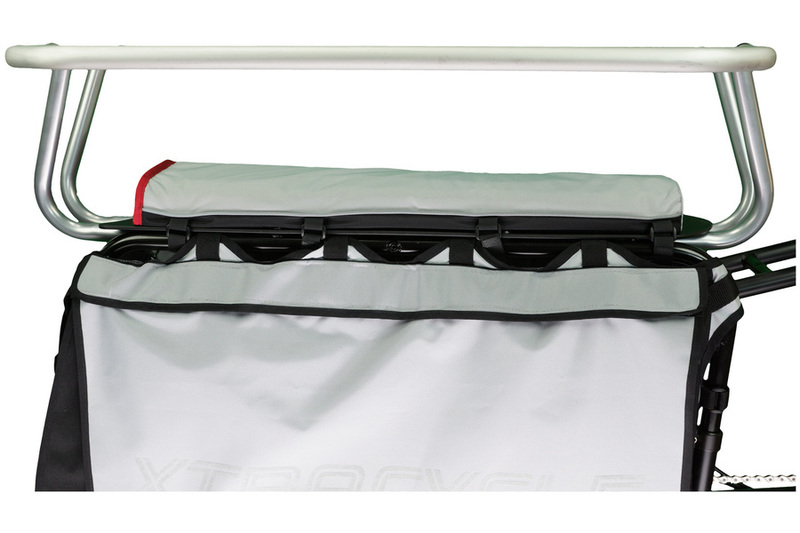 How to carry Xtracycle by car?